We quantified the ozone impact on levels of Zea mays L. cv. Chambord mRNAs encoding C4-phosphoenolpyruvate carboxylase (C4-PEPc), ribulose-l,5-bisphosphate carboxylase/oxygenase small and large subunits (Rubisco-SSU and Rubisco-LSU, respectively) and Rubisco activase (RCA) using real-time RT-PCR. Foliar pigment content, PEPc and Rubisco protein amounts were simultaneously determined. 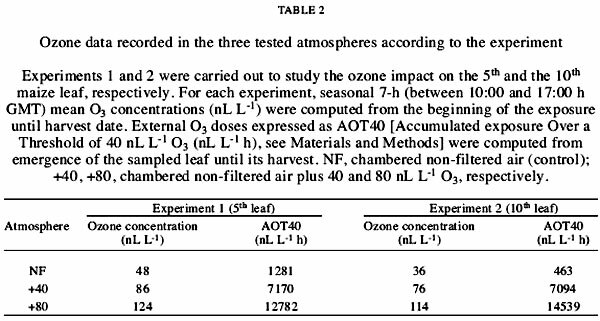 Two experiments were performed to study the ozone response of the 5th and the 10th leaf. For each experiment, three ozone concentrations were tested in open-top chambers: non-filtered air (NF, control) and non-filtered air containing 40 (+40) and 80 nL L-1 (+80) ozone. Regarding the 5th leaf, +40 atmosphere induced a loss in pigmentation, PEPc and Rubisco activase mRNAs. However, it was unable to notably depress carboxylase protein amounts and mRNAs encoding Rubisco. Except for Rubisco mRNAs, all other measured parameters from 5th leaf were depressed by +80 atmosphere. Regarding the 10th leaf, +40 atmosphere increased photosynthetic pigments and transcripts encoding Rubisco and Rubisco activase. Rubisco and PEPc protein amounts were not drastically changed, even if they tended to be increased. Level of C4-PEPc mRNA remained almost stable. In response to +80 atmosphere, pigments and transcripts encoding PEPc were notably decreased. Rubisco and PEPc protein amounts also declined to a lesser extent. Conversely, the level of transcripts encoding both Rubisco subunits and Rubisco activase that were not consistently disturbed tended to be slightly augmented. So, the present study suggests that maize leaves can respond differentially to a similar ozone stress. Nowadays, ozone (03) is recognized as the most phytotoxic and worrying common air pollutant. It is a secondary pollutant formed in the troposphere by the interaction of hydrocarbons, nitrogen oxides and sunlight (Cicerone, 1987; Thompson, 1992). Ozone, that enters the leaf through stomata, can severely affect the survival and yield of plants (Pell et al., 1997; Kolb and Matyssek, 2001). If acute stress from exposure to high concentrations of 03 for short periods of time generally produces visible injury, chronic 03 stress, resulting from exposure to low concentrations for a long period, produces few symptoms of damage and reduces growth (Heath and Taylor, 1997). Several studies have tried to elucidate the biochemical and molecular mechanisms of ozone toxicity. In short, it is admitted that ozone effects are generated by an excess of AOS which can react with membrane lipids, proteins and DNA resulting mainly in a reduced photosynthesis and an accelerated cell senescence (Pell et al., 1997). In maize (Zea mays L.), photosynthesis is performed following a C4 pathway which is a complex combination of both biochemical and morphological specialisation able to induce an increase in the C02 concentration at the site of Rubisco (EC 4.1.1.39) (Von Caemmerer and Furbank, 2003). The secondary autotrophic carboxylation reaction, catalysed by Rubisco, is compartmentalized within the bundle sheath cells and is dependent, for its supply of C02, on the primary carboxylation reaction, catalysed by PEPc (EC 4.1.1.31) in the cytosol of mesophyll cells (Hausler et al., 2002). Rubisco activity is regulated by Rubisco activase which activates Rubisco in vivo from an inactive complex by restoring the active Rubisco structure (see Portis (2003) for review). If literature related to the ozone impact on C3 species is very abundant, studies devoted to the response of C4 plants to ozone are particularly rare. Only two papers compared photosynthesis and yield responses of C3 and C4 plants to ozone (Heagle et al., 1988; Miller, 1988). Results from these studies tended to show that C4 plants were more ozone-tolerant than C3 plants. Although the ozone-induced impairment of C3 photosynthesis can be variously explained (Matyssek et al., 1997; Guidi et al., 2000; Dizengremel, 2001; Calatayud and Barreno, 2004), it is acknowledged that Rubisco is a central target for adverse ozone effects. On this subject, several experiments showed that appropriate ozone doses are able to reduce Rubisco quantity and to modify the enzyme structure by introducing carbonyl groups (Eckardt and Pell, 1995; Junqua et al., 2000; Dizengremel, 2001; Kanoun et al., 2002; Leitao et al., 2003). Assuming that the impact of additional carbonyl groups on Rubisco activity established in vitro (Eckardt and Pell, 1995) is not yet quantified in vivo, and that the impact of ozone on Rubisco activase remains unknown, the ozone-induced decline in Rubisco activity is generally regarded as a consequence of a loss in Rubisco protein content (Pell et al., 1994; Dizengremel, 2001; Pelloux et al., 2001). In C3 trees, this ozone-induced decline in Rubisco activity can be accompanied by a spectacular increase in the PEPc activity which reflects a significant stimulation of anaplerotic PEPc protein content (Dizengremel, 2001). Such an increase in PEPc activity probably enhances anaplerotic processes which might be efficient at promoting detoxification and repair of ozone injury by supplying reducing power and skeletons (Dizengremel, 2001). At the molecular level, in C3 species, a few studies tried to quantify ozone-induced variations of mRNA encoding PEPc and the two subunits constitutive of Rubisco. Using Northern blot and densitometric analyses of RT-PCR products, the authors showed that ozone was able to increase PEPc mRNA levels in pine, poplar, Norway spruce, and beech whereas it reduced Rubisco subunit mRNA levels in poplar, pine and potato (Eckardt and Pell, 1994; Pell et al., 1994; Glick et al., 1995; Brendley and Pell, 1998; Pelloux et al., 2001). Regarding C4 species, only one study based on the same techniques, reported that maize mRNA encoding Rubisco small subunit was decreased by massive ozone doses (Ruzsa et al., 1999). To our knowledge, there are currently no other data describing the effect of ozone on photosynthetic PEPc and Rubisco involved in the Hatch and Slack pathway. To gain new insights into the effect of air pollution on C4 plants, we aimed to detect and to quantify a possible ozone impact on the accumulation of some transcripts encoding key enzymes which control the photosynthetic carboxylation activities of Zea mays L. For this purpose, we developed a real-time RT-PCR method able to quantify levels of mRNAs encoding C4-phosphoenolpyruvate carboxylase (PEPc), ribulose-1,5-bisphosphate carboxylase/oxygenase small subunit (Rubisco-SSU), Rubisco large subunit (Rubisco-LSU) and Rubisco activase (RCA). Although it can be hazardous to connect mRNA levels to their respective protein contents (Boschetti et al., 1990; Eckardt and Pell, 1994; Glick et al., 1995; Moore et al., 1998), we also determined carboxylase protein contents. Simultaneously, we quantified chlorophylls and carotenoids since photosynthetic pigment degradation is regarded as a reliable parameter to estimate leaf senescence which is known to be ozone-accelerated in C3 plants (Matile et al., 1999; Pell et al., 1999; Calatayud and Barreno, 2004). All analyses were carried out on leaves from maize plants (Zea mays, L. cv. Chambord) exposed, at different development stages, to chronic and realistic ozone stresses. Concretely, we performed two fumigation experiments in order to compare the response of a lower (5th leaf) and of an upper leaf (10th leaf) to two polluted atmospheres enriched with 40 and 80 nL L-1 ozone, respectively; both leaves being fumigated during their growing period. The experiments were conducted at Montardon (43°N, 0e30'W, attitude 200 m above the sea level), 10 km north of Pau, France. Three atmospheres were experimented in open-top chambers (OTCs): non-filtered air (NF, control) and 2 ozone-enriched treatments using non-filtered air containing 40 nL L-1 (+40), and 80 nL L-1 (+80) ozone. Technical characteristics of OTCs, fumigation system, the monitoring and the computing of ozone data were previously detailed elsewhere (Junqua et al., 2000). Supplemental ozone was applied from 10:00 to 17:00 h Greenwich mean time (GMT) in order to simulate the normal period of ozone exposure. For each atmosphere, seasonal 7-h mean ozone concentration was computed from ozone hourly means between 10:00 and 17:00 h. Ozone dose was calculated as an Accumulated exposure Over a Threshold of 40 nL L-1 (AOT40) for each daylight hour with global radiation of 50 W m2 or greater, as defined for critical levels for ozone vegetation effects in Europe (Karenlampi and Skarby, 1996; Griinhage et al., 1999). Thus AOT40 (nL L-1 h) is the sum of the differences between the hourly mean ozone concentration and 40 nL L-1 for each hour when ozone concentration exceeds 40 nL L-1, accumulated from leaf emergence until sampling. The appearance of the lamina tip out of the whorl defined the leaf emergence date. Maize leaves were numbered from the basis to the top of the plant, the first leaf being the first appeared leaf and then the oldest leaf. A maize leaf is considered as fully expanded when its collar is visible. Two experiments were performed: the first experiment aimed to quantify the ozone impact on a lower leaf (5th leaf) sampled on young plants exposed for 33 days from emergence (19 May) and the second experiment aimed to detect the impact of an almost similar ozone stress on an upper leaf (10th leaf) sampled on older maize plants exposed for 28 days from the full expansion of the 7th leaf (21 June). From sowing until 21 June, these plants were grown in ambient air. Fifty-seven 2-L (19 for each atmosphere) and 27 12-L (9 for each atmosphere) base-perforated plastic pots filled with universal compost, were prepared for experiment 1 and 2, respectively. Although it may influence the plant microenvironment, the size of pots was chosen according to the plant development expected at the final harvest, for each experiment. Five maize caryopses (Zea mays, L. cv. Chambord) were sown per pot on 13 May. A very homogeneous emergence (about 95%) was recorded on 18 May and 19 May for 2-L pots placed in OTCs and 12-L pots maintained in ambient air, respectively. The number of plants per pot was gradually reduced to keep 1 plant per pot 10 days after emergence (DAE). During experiments, plants were always well-watered to avoid water stress effects and fertilized once a week with an NPK fertilizer (20:10:10) enriched in micronutrients. In experiment 1, 15 plants exhibiting 7 fully expanded leaves were harvested from each OTC 38 days after planting (33 DAE). In experiment 2, pots were distributed in the 3 OTCs on 21 June as maize plants exhibited 7 fully expanded leaves. Five maize plants per OTC were harvested 28 days later (61 DAE) as they displayed 13 fully expanded leaves. For each experiment, leaves were harvested in the early afternoon to avoid any influence of diurnal cycling on gene expression. The collected leaves were immediately frozen in liquid nitrogen and individually stored at -80°C until analysis. Since the 5th leaf was not large enough, extractions of transcripts, pigments and proteins were performed on three different sets of 5th leaves (5 leaves per set and per atmosphere). Regarding the large 10th leaf, these 3 extractions were done on the same leaf so that only one set of 10th leaves was used (5 leaves per atmosphere). Analyses were carried out on the central part of each collected leaf. For each experiment, 5 leaves per atmosphere were analysed. For each sampled leaf, the determination of pigment content was achieved from analysis of 4 foliar discs of 1.131 cm2 each. The discs from the 5th leaf were processed by pairs whereas those from the 10th leaf were individually analysed. Each disc pair or individual disc was ground with liquid nitrogen. Pigments were extracted by incubating leaves in 5 mL acetone 80% (v/ v) for 24 h at 4°C in darkness. The absorbance of leaf pigment extracts was measured at 470, 646.8 and 663.2 nm. Concentrations of chlorophyll a, b, total chlorophylls (a+b) and total carotenoids were calculated according to extinction coefficients and equations reported by Lichtenthaler (1987). Finally, data from either two pairs of discs (5th leaf) or from 4 individual discs (10th leaf) were averaged and the obtained mean concentration was expressed as µgcm2 of leaf. For each experiment, 5 leaves per atmosphere were analysed. Leaves were coarsely ground in a mortar under liquid nitrogen. Soluble proteins were extracted by reducing 600 mg of this ground to powder in a mortar with 6 mL of 0.1 M (Tris(hydroxymethyl)aminomethane)-HCl (Tris-HCl, pH 7.5), 5 mM ethylene glycol-bis(ß-aminoethyl ether)-tetraacetic acid (EGTA), 1 mM phenylmethylsulfonyl fluoride (PMSF), 1 µM pepstatin, 2 mM dithiothreitol (DTT), 5 mM MgCl2, 10 mM NaHC03, 1.5% (w/v) polyvinylpolypyrrolidone and 5 µg mL-1 leupeptin. After centrifugation at 17 608 g at 4°C for 15 min, proteins present in the supernatant were precipitated according to Leitao et al. (2003). After a new centrifugation (17 608 g, 4°C, 10 min), pellets were resuspended in 200 µL of extraction buffer. Protein concentrations were determined by the procedure of Bradford (1976) using a protein assay reagent (Biorad) and bovine serum albumin as a standard. Estimation of Rubisco-SSU, Rubisco-LSU and PEPc quantities were performed according to a previously published procedure (Kanoun et al., 2002; Leitao et al., 2003). Relative amounts of Rubisco-SSU, Rubisco-LSU and PEPc were expressed as a percentage of soluble proteins. For each experiment, 5 leaves were analysed per atmosphere. The central part of each lamina was ground in a mortar with liquid nitrogen. Approximately 0.1 g of the powder was transferred to a 2 mL microcentrifuge tube. Total RNA was extracted with Plant Rneasy kit (Quiagen) according to manufacturer's instructions. Quantitative and qualitative integrity measurements of RNAs were assessed by absorbance ratio (A260nm/ A280nm) and by capillary electrophoresis using a Bioanalyser 2100 (Agilent Technologies), respectively. RNA extracts were stored at -80°C. One µg of RNA was made free of DNA by incubating with DNAse I for 15 min at 25 °C, according to the recommendations of the supplier (Sigma). This DNA degradation process was followed by (i) thermal inactivation of the enzyme in presence of 50 mM EDTA (70°C, 10 min) and (ii) a rapid cooling down to 4°C. Reverse transcription (RT) reactions were performed with Superscript III First-Strand Synthesis System for RT-PCR following manufacturer's instructions (Invitrogen) in a PTC 200 thermocycler (MJ Research, Watertown, MA). To minimize possible variations of cDNA synthesis during RT process, six separate RT reactions were performed and pooled for each RNA extract. Then, 2.5 µM oligo(dT)2o primers and 0.5 mM dNTP were hybridised to DNase-treated total RNA in a volume of 10 µL by heating up to 65 °C for 5 min, then placed on ice. First-strand cDNA was synthesised by incubating the previous RNA-containing mixture with IX RT buffer, 5 mM MgCl2, 0.01 M DTT, 40 units RNase OUT and 200 units Superscript III RT in a 20 [iL final reaction volume. The RT reaction was performed sequentially for 50 min at 50°C, for 5 min heating at 85°C and a rapid cooling down to 4°C followed by RNase H treatment (Invitrogen). cDNAs were immediately used and/or stored at -20°C until analysis. In order to test cDNA amplification products specificity, a reverse transcription reaction without enzyme was simultaneously performed. The PCR primers were designed using Primer Express 2.0 software (Applied Biosystems). Each gene sequence was obtained from public database. Each primer was designed to produce approximately a 100 bp-amplicon according to Applied Biosystems' recommendations. Primer sequences for amplification of C4-phosphoenolpyruvate carboxylase (PEPc), Ribulose-1,5-bisphosphate carboxylase small subunit (Rubisco-SSU), Ribulose-1,5-bisphosphate carboxylase large subunit (Rubisco-LSU), ribulose-1,5-bisphosphate carboxylase/oxygenase activase (RCA) and maize actin genes by real-time PCR are listed in Table 1. Rubisco-SSU primers were designed to fit both Rubisco-SSU genes described in literature (Hanhen et al., 2003). Gene specificity of each primer was confirmed throughout BLAST searches in public databases. Furthermore, the specificity of RT-PCR products was assessed by monitoring the dissociation curves after real-time RT-PCR reactions in ABI Prism 5700 sequence detection System (Perkin-Elmer Applied Biosystems) and analysing their size using electrophoresis with ethidium bromide staining on a 4% agarose gel. Real-time RT-PCR was carried out using SYBR Green PCR master mix (Applied Biosystems) in the ABI Prism 5700 Sequence detection system (Perkin-Elmer Applied Biosystems) with a GeneAmp 5700 PCR thermocycler, according to the protocol provided by the supplier. Triplicate amplification reactions were performed in 20 µL IX SYBR Green PCR master mix containing 300 nM of each primer (forward and reverse) and 5 µL cDNA. PCR parameters were those recommended by the manufacturer. Melt curves and derivative melt curves were run after the last PCR cycle. Melt curves were produced by plotting the fluorescence intensity versus temperature as the temperature increased from 60 to 95°C. The real-time RT-PCR efficiency was determined for each gene with the slope of a linear regression model (Pfaffl, 2001) by measuring the Ct value to a specific threshold for a serial dilution of RNA (Walker, 2002). Since all RT-PCR efficiencies were above 98%, the comparative Ct method which was similar to the standard curve method (Applied Biosystems User Bulletin #2), was used. The use of GeNorm software (Vandesompele et al., 2002) as well as Brunner et al. 's procedure (Brunner et al., 2004) showed that the expression of actin, a housekeeping gene, was stable enough to be used as an internal standard for RT-PCR to allow normalization of real-time RT-PCR data. Normalized amplification data are calculated and expressed as 2(Ctactm~ Ct§ene) where Ct corresponds to the number of cycles needed to generate a fluorescent signal above a predefined threshold (Ferry etal.,2003). For each treatment, results are expressed as means associated with standard error (SE). The significance of ozone treatment impacts were tested using a one-way analysis of variance (ANO VA). Each time a significant difference was accepted (<0.05), groups of homogeneous means were detected with the help of a Newman-Keuls test based on the minimum significant range (Sokal and Rohlf, 2001). All statistical analyses were carried out using STATBOX (version 6.4) software package. Ozone data recorded in NF, +40 and +80 treatments are reported in Table 2. In control treatments, the 5th and 10th leaves were exposed to seasonal 7-h mean ozone concentrations of 48 and 36 nL L-1, respectively. In experiment 1, the ozone concentrations registered in +40 and +80 regimens during the 7-h 03-enrichment were roughly 1.8- and 2.6-fold that of the ambient control (NF), respectively. In experiment 2, they were roughly 2.1- and 3.2-fold that of NF. Although the external AOT40 ozone dose experienced by the 5th leaf in control treatment (NF) was 2.8-fold greater than that experienced by the 10th leaf, both leaves were exposed to almost similar AOT40 doses in each of the two ozone-enriched treatments. The AOT40 ozone dose that the 5th and the 10th leaves received in +80 atmosphere was about 2-fold superior to that computed in +40 atmosphere. At the date of their respective harvest, no visible damage was exhibited by the 5th and 10th leaves from control atmosphere (NF). Tenth leaves from +40 and +80 atmospheres appeared as healthy as those from NF conditions: neither colour change nor particular necrosis could be observed on their laminae. Conversely, 5th leaves from ozone-enriched atmospheres exhibited senescence symptoms crescent with the external ozone dose: chlorosis was more pronounced in +80 atmosphere than in +40 atmosphere. Moreover, in +80 atmosphere the lamina tip (1.5-2 cm) of the yellowish 5th leaf was completely withered. In any case the senescence proceeded in the same manner as leaf development: from the top of the leaf (made of older cells) to the base (made of younger cells). As shown in Figure 1, the photosynthetic pigmentations of the 5th and 10th leaves were differentially affected by ozone. Regarding the 5th leaf, pigment data matched the visual aspect of the lamina. In control atmosphere (NF), total chlorophyll and total carotenoid contents were on average, 47.40 µg cm-2 and 7.37 \ig cm-2, respectively. A decline in total chlorophylls by about 35 and 47% was evidenced in +40 and +80 treatments, respectively, relative to the control (NF). Such a significant reduction (<0.001) can be ascribed to consistent losses in both Chi a (<0.001) and Chi b (<0.001) (Fig. 1). However, as suggested by the Chi a/b ratio, Chi a tended to be more affected than Chi b (<0.01). This trend became significant only in the highest ozone-enriched treatment (+80). Indeed, in +80 atmosphere Chi a was decreased by 52% whereas Chi b was decreased by only 35%, compared to the control. The ozone-induced decline in total carotenoid content was also significant (<0.001) and almost similar to the reduction in total chlorophylls. Therefore, total carotenoids were decreased by 32% and 54% in +40 and +80 treatments, respectively. However, the Chi a+b/total Car ratio was slightly but consistently (<0.05) increased in +80 treatment. This result suggests that carotenoids might be more sensitive to ozone than chlorophylls. Regarding the 10th leaf, ozone-induced changes in pigment content were accompanied by no change in leaf colour that could be visually assessed. Under normal atmosphere, the 10th leaf was richer in photosynthetic pigment than the 5th leaf. In mature 10th leaf from NF atmosphere, Chi a, Chi b and total carotenoid concentrations were about 42%, 15% and 60% higher than in the control mature 5th leaf, respectively. Therefore, in the control upper leaf (10th), Chi a/b ratio was definitely greater whereas Chi a+b/total Car was lower, relative to the control lower leaf (5th). 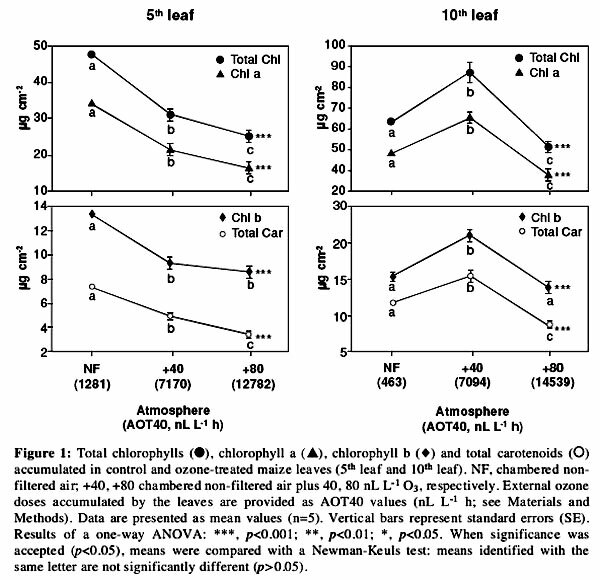 In any case, ozone was also able to significantly modify total chlorophyll (<0.001), Chi a (<0.001), Chi b (<0.001) and total carotenoid (<0.001) contents in the 10th leaf (Fig. 1). However, its effect was more complex than that observed for the 5th leaf. Indeed, a moderate addition of 40 nL L-1 ozone to the ambient concentration (+40 atmosphere) consistently increased total chlorophylls (+36%), Chi a (+37%), Chi b (+34%) and total carotenoids (+30%), relative to the control. This stimulation of pigment accumulation affected neither Chi a/b ratio nor Chi a+b/total Car ratio. Conversely, the highest polluted atmosphere (+80 nL L-1ozone) induced a significant decline in total chlorophylls (-22%), Chi a (-26%), Chi b (-12%) and total carotenoids (-25%), relative to the control. As already observed in the 5th leaf, Chi a was much more reduced by ozone than Chi b and the extent of reduction in total carotenoid content was close to that registered for Chi a. The preferential degradation of Chi a, relative to Chi b, was underlined by the significant fall in the Chi a/b ratio (<0.01). In the same way as for the 5th leaf, the Chi a+b/total Car ratio determined in the 10th leaf appeared rather insensitive to the deleterious ozone effects. For each primer set, the specificity of SYBR Green detection of real-time RT-PCR products was assessed by dissociation curve analysis and agarose gel electrophoresis. For example, regarding Rubisco-LSU, a single dissociation peak was obtained for an experimental melting temperature (Tm) of 78°C that was very close to the theoretical Tm of 79°C. The presence of a single amplification product was confirmed by gel electrophoresis where only a single band, with a predicted size of 72 bp, was visible. All these data indicated that Rubisco-LSU real-time RT-PCR assay was gene-specific and could not be confused with non-specific amplification and/or primer dimer. Melting curves and gel analyses for all other primer sets (Rubisco-SSU, Rubisco activase and PEPc) matched well. Ozone was able to reduce PEPc transcripts in the 5th leaf (<0.001) as well as in the 10th leaf (<0.01) (Fig. 2). However, the effect of a given external ozone dose on PEPc mRNA levels could vary with leaf rank. Indeed, an AOT40 of 7170 nL L-1 h (achieved in +40 atmosphere) significantly reduced the PEPc transcripts by 59% in the 5th leaf whereas an almost similar external ozone dose of 7094 nL L-1 h (also achieved in +40 atmosphere) did not change their amount in the 10th leaf. In any case, the highest ozone dose accumulated in +80 atmosphere significantly decreased PEPc mRNA in both 5th (-59%) and 10th (-79%) leaf. In control atmosphere (NF), the foliar relative amount of PEPc protein did not vary significantly between lower and upper leaves (p-0.370). On the average, PEPc protein accounted for circa 15% of soluble proteins extracted from the 5th leaf whereas, in the 10th leaf, it accounted for circa 14% of soluble proteins. The 03-induced variations in PEPc protein content roughly reflected changes observed in mRNA quantities even if depletion percentages were not always comparable (Fig. 2). 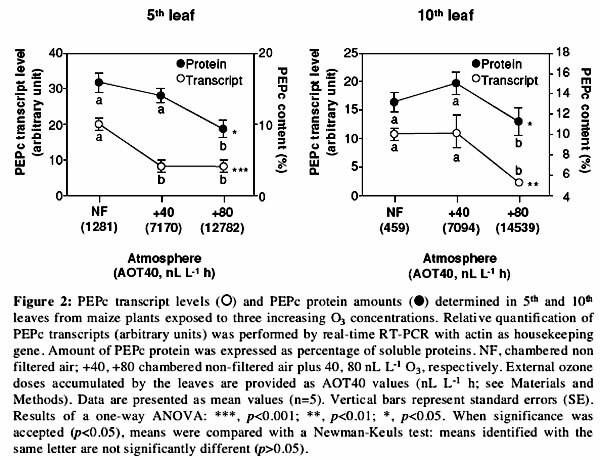 Regarding the 5th leaf, a significant reduction in PEPc protein was noticed exclusively in +80 atmosphere (-44%, relative to the control) whereas transcripts were already drastically reduced in +40 atmosphere. As previously described for transcripts, +40 atmosphere did not consistently change the PEPc protein content in the 10th leaf whereas +80 atmosphere significantly reduced the protein by 25%, i.e. 3-fold less than mRNA quantities. In the atmosphere with highest pollution (+80), the percentage of PEPc protein was more severely depressed in the 5th leaf (-44%) by an AOT40 of 14539 nL L-1 h than in the 10th leaf (-25%) for an almost comparable AOT40 of 12782 nL L-1h. The ozone impact on the accumulation of mRNAs encoding both Rubisco-SSU and Rubisco-LSU is displayed in Figure 3. Whatever the tested atmosphere, the amounts of SSU and LSU transcripts extracted from the 5th leaf remained statistically stable (p=0.338 and p-0.634 for SSU and LSU, respectively). This was also true for LSU mRNA from the 10th leaf (p=0.231) in spite of a trend towards an increase in both ozone-enriched atmospheres as compared to the control (NF). Also in the 10th leaf, this trend became significant for SSU (<0.001): the level of SSU transcripts increased by 338% and 59%, in +40 and +80 atmosphere, respectively, relative to NF. Focusing on Rubisco protein, it appeared that the control 10th leaf was slightly richer (p=0.018) in Rubisco-SSU (circa 12% of soluble proteins) than the control 5th leaf (circa 8% of soluble proteins) (Fig. 3). In contrast, from a statistical viewpoint, these two leaves contained similar average amounts of Rubisco-LSU (p=0.170): about 24% for the 5th leaf and 26% for the 10th leaf. In the 10th leaf, the amounts of both Rubisco subunits were not consistently disturbed by ozone (p=0.055 and p=0.062) even if, they tended to respond to increasing ozone concentration in the same way as transcripts did. As compared to the control, a small average increase was observed in +40 atmosphere (+14% for SSU and +13% for LSU) whereas a small average reduction was noticed in +80 atmosphere (-11% for SSU and -12% for LSU). With regard to the 5th leaf, SSU and LSU proteins exhibited a response to ozone distinct from that shown by their corresponding transcripts. Indeed, ozone significantly reduced both SSU (p<0.001) and LSU (p<0.01) proteins. However, these declines were reliable only in +80 atmosphere: -31% for SSU and -29% for LSU. Accumulation of transcripts encoding Rubisco activase did not seem very sensitive to ozone exposure (Fig. 4). Despite the occurrence of mean variations in transcript amounts that could reach 50% relative to the control, no significant changes were statistically assessed probably because of some important within-atmosphere variances. However, RCA mRNAs from the 5th and 10th leaves clearly showed distinct trends in their response to ozone. Indeed, as quantities of RCA mRNAs accumulated in the 5th leaf decreased by -37% and -44% in +40 and +80 atmosphere, respectively and relative to the control, RCA mRNAs accumulated in the 10th leaf increased by 50% and 36%. The control 10th leaf accumulated larger amounts of photosynthetic pigments (Chi a, Chi b and Car) than the control 5th leaf. The 5th leaf is a small leaf as compared to the 10th leaf. Despite its rather short lifespan, the 5th leaf sampled in control atmosphere was particularly healthy. It exhibited no visible sign of senescence at the harvest date. Thus, the difference in pigment content between control 5th and 10th leaf could be ascribed to (i) a pigment loss in the 5th leaf resulting from a natural senescence process which is not sufficiently advanced to be visually assessed or/and (ii) a greater pigment accumulation in the 10th leaf that could be variously explained. Focusing on this last hypothesis, the increase in pigment content measured in the 10th leaf does not necessarily mean that thylakoids are richer in pigments or/and that cells are richer in chloroplasts. It may basically be due to the unit in which pigment concentrations are expressed (mg cm2) since that unit takes neither foliar dry matter nor leaf thickness into account. Indeed, it has been reported that leaf mass per unit leaf area (LMA) augments with leaf rank in maize plants (Drouet et al., 2005). Such an increase in LMA may result from an increase in leaf thickness (Maurice et al., 1997). Thus, the 10th leaf appears richer in pigments than the 5th leaf probably because it is thicker and therefore contains a much more important number of mesophyll cells. Although they roughly experienced the same AOT40 doses in each of the two ozone-enriched atmospheres, 5th and 10th leaves exhibited distinct pigment responses to ozone. The decline in pigment content with increasing ozone concentration could be expected since it had been previously reported that ozone was able to accelerate leaf senescence by triggering an oxidative burst (Castagna et al., 2001; Calatayud and Barreno, 2004). If the deleterious ozone effect on photosynthetic pigments had been shown in many C3 species (Castagna et al., 2001; Calatayud and Barreno, 2004), no data were available in maize. Nevertheless, a decrease in maize chlorophyll content in response to different abiotic stresses (ultraviolet-B radiation or herbicide) known to generate AOS formation had been already reported (Jung, 2003; Correia et al., 2004). In our experiment, the loss in both chlorophylls (a and b) and carotenoids augmented across +40 and +80 atmosphere in the 5th leaf while for the 10th leaf, it occurred to a lesser extent only in +80 atmosphere. Thus, an AOT40 of 12782 nL L-1 h (accumulated in +80 atmosphere) reduced pigment content in the 5th leaf drastically enough to be visible, whereas an almost similar AOT40 of 14539 nL L-1 h slightly depressed the pigment content of the 10th leaf without modifying its visual aspect. The preferential degradation in Chi a that was noticed in both leaves from +80 atmosphere, relative to Chi b, was also expected since it had previously been reported in response to ozone, in C3 species (Castagna et al., 2001). If the effect of the eproductive growth on the profiles of maize leaf senescence was investigated with special regard to the node (Sadrás et al., 2000), there are currently no clear data able to allow a comparison between senescence patterns of 5th and 10th leaves. Nonetheless, the distinct negative ozone impacts on pigmentation may be related to different physiological abilities. Indeed, the 10th leaf that contributes to corn filling is characterized by a longer lifespan than the 5th leaf that naturally begins to senesce earlier after its full leaf span. So, as compared to the 10th leaf, a much more ozone-accelerated senescence in the 5th leaf could be expected. The consistent increase in pigment content (Chi a, b and Car) that was observed in the 10th leaf in response to a moderate addition of ozone (+40 atmosphere) was more unexpected. Until now, only slight indications of a higher foliar chlorophyll concentration have been detected in potato and birch samplings grown under elevated 03 (Bindi et al., 2002; Karlsson et al., 2003). Comparatively, the pigment rise we evidenced (approximately +33%) is more spectacular and could be regarded as an adaptative response. By promoting light reactions of photosynthesis, it may contribute to enhance production of both ATP and reducing power required for detoxification and repaired processes. On the contrary, the ozone-induced pigment degradation can limit the ability of plants to use energy and consequently can contribute to the impairment of photosynthesis. With special regard to unstressed leaves from control treatment, we showed that carboxylase protein of the mature 5th leaf (lower leaf) was roughly similar to that of the mature 10th leaf (upper leaf). These relative amounts expressed as percentages of soluble proteins matched those already reported in maize (Sugiyama et al., 1984). The analysis of real-time RT-PCR data revealed that ozone was able to differentially disturb the amount of mRNAs encoding PEPc, Rubisco and Rubisco activase. Such ozone-induced changes in transcript levels did not necessarily reflect parallel changes in the protein products of these genes. Firstly, the transcript accumulation we measured must be regarded as a balance between transcription activity and mRNA stability that can be controlled in part, by further post-transcriptional events (DeRocher and Bohnert, 1993; Glick et al., 1995; Pell et al., 1997). Secondly, a tight linkage between mRNA quantity and the amount of its corresponding protein must not systematically be expected since (i) all transcripts are not necessarily translated and (ii) post-translational events as well as protein degradation also regulate protein accumulation (Moore et al., 1998; Suzuki et al., 2001; Cohen et al., 2005). On this subject, it is acknowledged that the expression of genes encoding Rubisco-SSU, Rubisco-LSU and PEPc may be regulated at transcriptional, translational and post-translational levels (Eckardt and Pell, 1994; Glick et al., 1995; Pell et al., 1997; Moore et al., 1998; Suzuki et al., 2001; Cohen et al., 2005). Besides, ozone may differentially modify mRNA and protein accumulation. PEPc is a cytosolic carboxylase made of four identical subunits of about 110 kDa each (Nimmo, 2003). In C4 species such as corn, the photosynthetic isoform is responsible for primary C02 fixation that characterizes C4 photosynthesis (Hudspeth and Grula, 1989). As for photosynthetic pigments, the highest ozone-enriched treatment (+80) drastically reduced C4-PEPc transcripts in both sampled leaves whereas a moderate ozone addition (+40 treatment) corresponding to an external ozone dose of circa 7100 nL L-1 h could or could not decrease C4-PEPc mRNA accumulation in the 5th and 10th leaves, respectively. Variation patterns of PEPc protein content correlated roughly with mRNA data: changes followed the same direction, however, they did not have similar magnitudes. Light distortions in the correlation arose especially for +40 treatment. Indeed, in that atmosphere, the 10th leaf PEPc protein content slightly increased (+37%) whereas mRNA pool encoding C4-specific PEPc isoform remained stable. In the 5th leaf from the same atmosphere, the PEPc protein content was slightly decreased whereas the C4-specific PEPc mRNA was severely decreased. 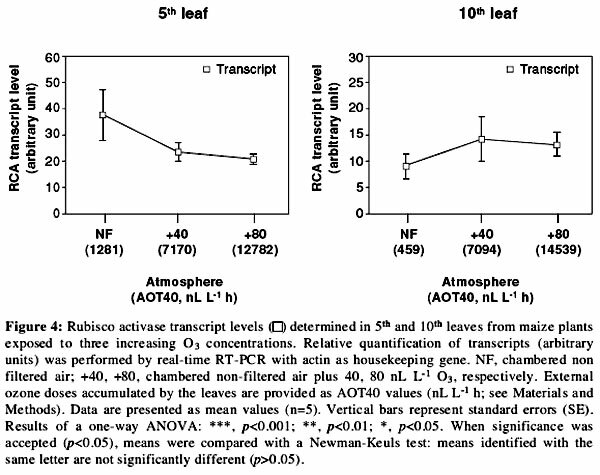 Whatever the leaf, a much more important external ozone dose accumulated in +80 atmosphere (AOT40 of 12782 and 14539 nL L-1 h for 5th and 10th leaf, respectively) reduced both mRNA and protein suggesting that 03-derived AOS were produced in ample amounts to promote, via a transduction signal pathway, the deceleration of protein biosynthesis and probably an increase in protein degradation (Pell et al., 1997). In any case, we never detected an increase in PEPc protein or mRNA levels as previously reported for C3 species (Dizengremel, 2001). When it occurs, the loss in PEPc content might be partly the result of a biosynthesis inhibition at transcription level as suggested by the decrease in the corresponding transcripts. Rubisco is a holoenzyme made of eight nucleus-encoded small subunits (SSU) and eight chloroplast-encoded large subunits (LSU). Its activity is partly regulated by another protein, Rubisco activase (Spreitzer, 1999). In control 5th and 10th leaves, the ratio of RbcL to RbcS mRNA was close to that (10:1) previously reported in maize leaves (Sheen and Bogorad, 1986). Whatever the atmosphere tested, this ratio remained roughly unchanged. Surprisingly, ozone seemed to have no impact on Rubisco-related mRNAs from the 5th leaf whereas in the 10th leaf, contrary to what had been observed for PEPc mRNAs, ozone was able to slightly increase both LSU and SSU transcripts especially when it was added in moderate concentration (+40). These data contrast with those from Ruzsa et al. (1999) who tested high ozone concentrations. Indeed, using Northern blot analysis, these authors showed that maize mRNA encoding Rubisco small subunit was decreased by (i) a single 6 h exposure to ozone concentrations ranging from 300 to 1000 nL L-1 and (ii) 3, 6, or 10 days of repeated exposure to ozone concentrations ranging from 100 to 300 nL L-1 (Ruzsa et al., 1999). These declines matched other results gained from various C3 plants. 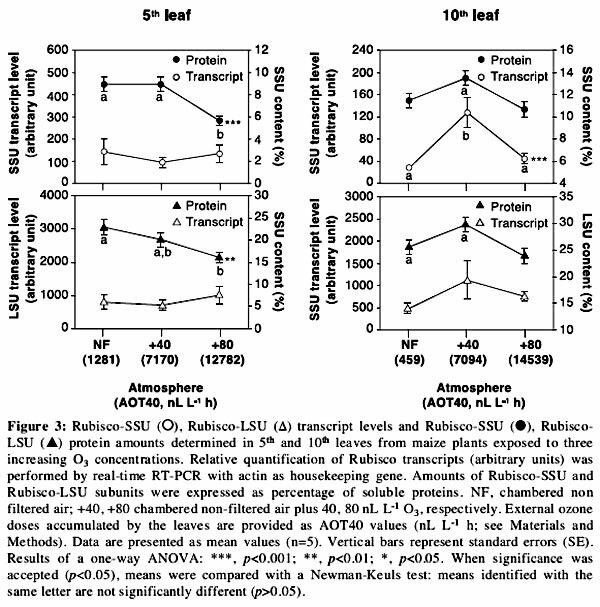 By means of Northern blot, it was shown that RbcS and RbcL transcripts were reduced in potato leaves exposed for 3 days to 80 nL L-1 ozone (Glick et al., 1995) whereas RbcS transcripts declined in Arabidopsis leaves exposed for 2 weeks to 150 nL L-1 ozone (Miller et al., 1999). Bahl and Kahl (1995) suggested that, in response to an air pollutant stress, transcription reduction of some light-regulated photosynthesis genes like RbcS could result from oxidative damages affecting photoreceptors and/or signal transduction molecules (Quail, 1991). As a confirmation, a blocked transcription of Rubisco-SSU gene has been already described in maize cells, upon photooxidation (Mayfield and Taylor, 1987). In the 5th maize leaf, the absence of an ozone effect on Rubisco mRNA quantity could be connected with a probable age-related reduction in transcription activity as suggested by the amount of total RNA extracted from the control 5th leaf that was about 2.8 times lesser than RNAs present in the control 10th leaf (data not shown). Since it is admitted that synthesis of Rubisco declines once leaves are fully expanded (Dalling, 1987), Reddy et al. (1993) postulated that the impact of ozone on transcript level in mature leaves could not be as consistent as for the younger leaves. Still in the 5th leaf, the ozone-induced variations in SSU and LSU protein amounts were almost similar to that observed for PEPc: no spectacular changes were detected for an AOT40 of 7170 nL L-1 h (+40 atmosphere) whereas a decline by a little less that one third was registered in response to an AOT40 of 12782 nL L-1 h (+80 atmosphere). In contrast to the results from Eckardt and Pell (1994) who found that LSU was less responsive to ozone than SSU but matching our previous results gained from bean (Junqua et al., 2000), we showed that both subunits of maize Rubisco were equally reduced by an appropriate ozone dose. Such similar reductions might reflect distinct ozone impact. Indeed, it has been postulated that the maintenance of subunit stoichiometries may be driven by two principal mechanisms: LSU would be preferentially adjusted at the level of RbcL mRNA translation initiation whereas SSU levels would be preferentially adjusted at the level of protein degradation (Rodermel, 1999). However, the decrease in Rubisco protein during natural senescence of leaves can also be accompanied by coordinated decreases in the levels of mRNAs for the small and large subunits of Rubisco (Jiang et al., 1993). In any case, the loss in Rubisco protein that has been extensively reported in C3 species exposed to ozone, is often regarded as a consequence of an enhancement in proteolysis activity related to an ozone-accelerated senescence process (Pell et al., 1994; Brendley and Pell, 1998; Junqua et al., 2000; Dizengremel, 2001). In our case, the idea that the reduction in Rubisco protein content is not due to a decline in transcription activity is corroborated by the study of the 10th leaf from +80 atmosphere that also exhibited a slightly reduced Rubisco content together with a trend towards an increase in corresponding transcripts. Regarding photosynthetic genes including RbcS, it has been previously reported that atmosphere-induced changes in the steady-state transcript levels do not necessarily reflect similar changes in the concentrations of corresponding proteins (Bahl and Kahl, 1995; Moore et al., 1998). Irrespective of a protein degradation acceleration, the absence of correlation between SSU and LSU transcript variations and their respective products could also be due to a possible oxidative alteration of the translation system, as already suggested by Reiss et al. (1983) in the case of a photooxidative stress. With regard to the 10th leaf, the most original event was recorded in +40 atmosphere and consisted in the concomitant increase in both Rubisco subunit content (SSU and LSU) and their respective transcripts. To our knowledge it is the first time that such a phenomenon is observed in response to a moderate chronic ozone stress. Until now, the effect of stresses on Rubisco activase has been poorly investigated (Portis, 2003). More precisely, to our knowledge, there are no data regarding the specific effect of ozone on Rubisco activase. Rubisco activase transcripts from the 5th leaf tended to be less abundant in both ozone-enriched atmospheres related to the control, suggesting that Rubisco from ozonated 5th leaf might be less activated. Conversely, the addition of either 40 or 80 nL L-1supplemental ozone tended to promote the accumulation of Rubisco activase transcripts in the 10th leaf. Even if measurements of steady-state mRNA content do not necessarily reflect the rate of translation or protein synthesis (Boschetti et al., 1990), our results suggest that ozone may either up- or down-regulate the carboxylation activity catalysed by Rubisco by modifying the quantity of the enzyme and/or by changing regulation of its activity. To conclude, we showed that during its growing period a maize upper leaf such as the 10th leaf is able to respond to a moderate external ozone dose (7094 nL L-1 h) by increasing photosynthetic pigments and transcripts encoding Rubisco and Rubisco activase. Level of C4-PEPc mRNA remained almost stable. Rubisco and PEPc protein amounts were not drastically changed, even if they tended to be increased. In response to a higher ozone dose (14539 nL L-1 h), pigments and transcripts encoding C4-PEPc were notably decreased. Conversely, levels of transcripts encoding both Rubisco subunits and Rubisco activase were not consistently disturbed even if they tended to be slightly augmented. Rubisco and PEPc protein amounts slightly declined. Regarding the 5th leaf, the moderate external ozone dose (7170 nL L-1 h) induced a loss in pigmentation, PEPc and Rubisco activase mRNAs. However, this moderate stress was unable to notably depress carboxylase protein amounts and mRNAs encoding Rubisco. Except for Rubisco mRNAs, all other measured parameters from the 5th leaf were depressed by the highest ozone dose (12782 nL L-1 h). Although the intensity of the measured ozone-induced variations might be affected by an open-top chamber effect, we showed that maize leaves can respond differentially to a similar ozone stress. Louis Leitao is the recipient of a grant from the Region Aquitaine. This research programme is part of the multidisciplinary BioPollAtm project which is mainly funded by the Ministére de l'Ecologie et du Développement Durable (programme PRIMEQUAL 2), the Agence de l'Environnement et de la Maitrise de l'Energie (Ademe), the Ministére Delegué á la Recherche (ACI Ecologie Quantitative, programme Biosphere Continentale) and the Institut National des Sciences de l'Univers / CNRS (Programme National de Chimie Atmosphérique). Additional financial support has come from the Region Aquitaine and the Conseil General des Pyrénées-Atlantiques. We gratefully acknowledge Pr Eric Pinelli and Bertrand Pourrut for providing various facilities. We are thankful to Arnaud Verbaere for technical assistance. We also wish to thank Isabelle Langlois and the technical support of the Applied Biosystems company as well as the genomic platform of the Instituí Fédératif de Recherche 31 (Instituí Louis Bugnard, CHU Rangueil, 31432 Toulouse, Cedex 4) for providing excellent support during the setup of real-time PCR systems. We are indebted to Neau Eric for GeNorm analysis advice and to Arnaud Betbeder for English language improvement. ABBREVIATIONS USED: AOS, active oxygen species; AOT40, accumulated exposure over a threshold of 40 nL L-1ozone; Car, carotenoid; Chi, chlorophyll; cDNA, complementary deoxyribonucleic acid; DAE, day after emergence: mRNA, messenger ribonucleic acid; NF, non-filtered air; OTC, open-top chamber; PEPc, phosphoenolpyruvate carboxylase; RT-PCR, reverse transcription polymerase chain reaction; Rubisco, ribulose-l,5-bisphosphate carboxylase/ oxygenase; Rubisco-SSU, Rubisco small subunit; Rubisco-LSU, Rubisco large subunit; RCA, ribulose-l,5-bisphosphate carboxylase/oxygenase activase; RuBP, ribulose-l,5-bisphosphate; +40, +80, chambered non-filtered air supplied with 40 and 80 nL L_1 ozone, respectively.